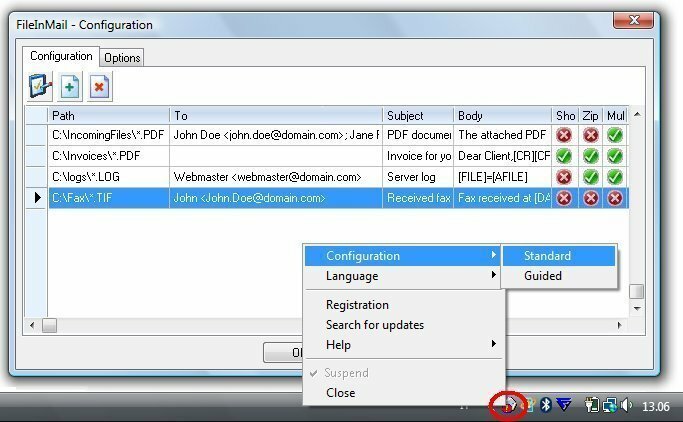 File, Mail, monitor directory, automatically email files files are archived on disk, even as ZIP, and forwarded via e-mail to one or more recipients through your own e-mail Client program or an SMTP server. FileInMail automatically monitors one or more directories for specified files. As soon as they appears, the files are archived on disk, eventually compressed as ZIP files, and forwarded via e-mail to one or more recipients through your own e-mail Client program or an SMTP server, with or without user intervention.